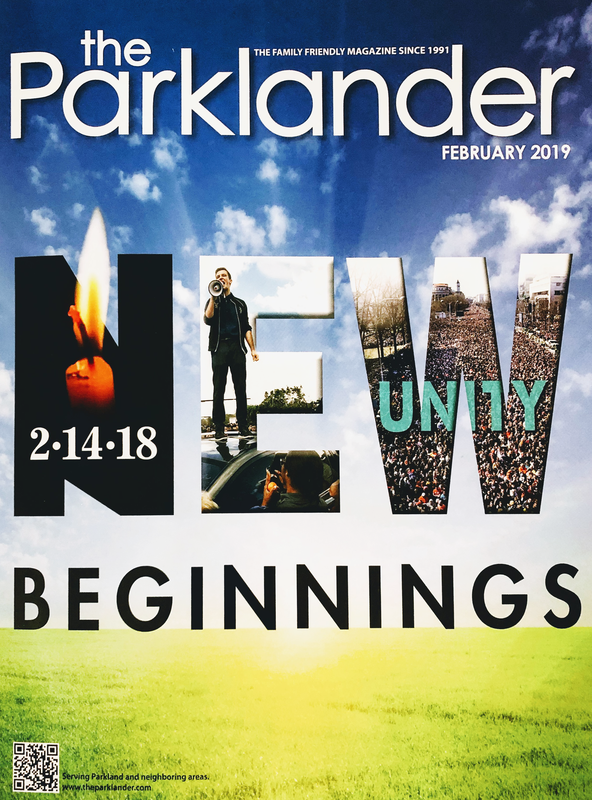 The local family-friendly magazine, The Parklander, dedicated its February cover to commemorate the victims of the Stoneman Douglas High School shooting. 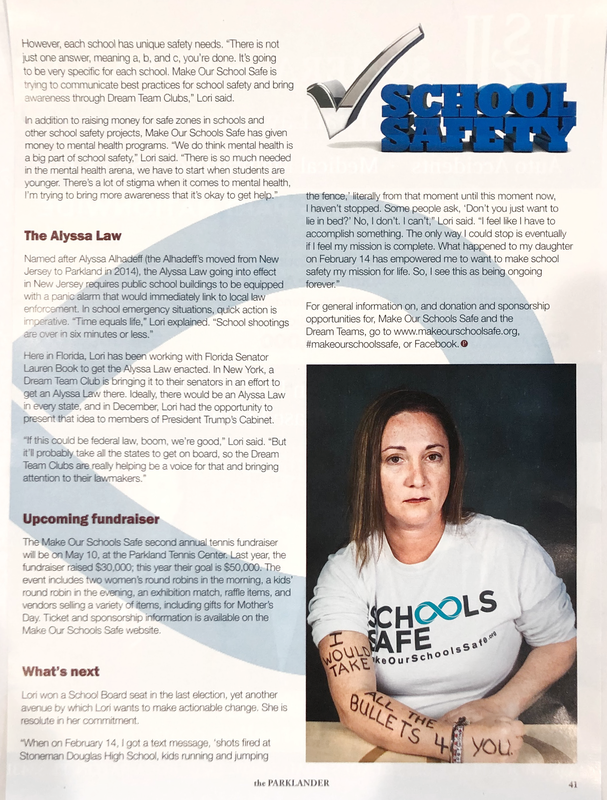 As one of the most vocal school safety supporters and advocates, Lori Alhadeff, one of the founders of Make Our Schools Safe, was invited to share details on her mission for creating a safer school environment for all students. In her interview, Lori opens up about the emotional rollercoaster she goes through every day since the shooting, but she also says that being involved in school safety activities is her own way of healing. “I want to honor Alyssa and help all of the other kids. I am not focusing on guns because it is too polarizing… I know people are fighting that fight, and I thank them. I think parents and students going at the school safety problem all different ways is wonderful. Because you need everybody,” Lori explains. Shortly after the loss of her daughter, Lori founded Make Our Schools Safe, a non-profit organization that aims to improve school safety. 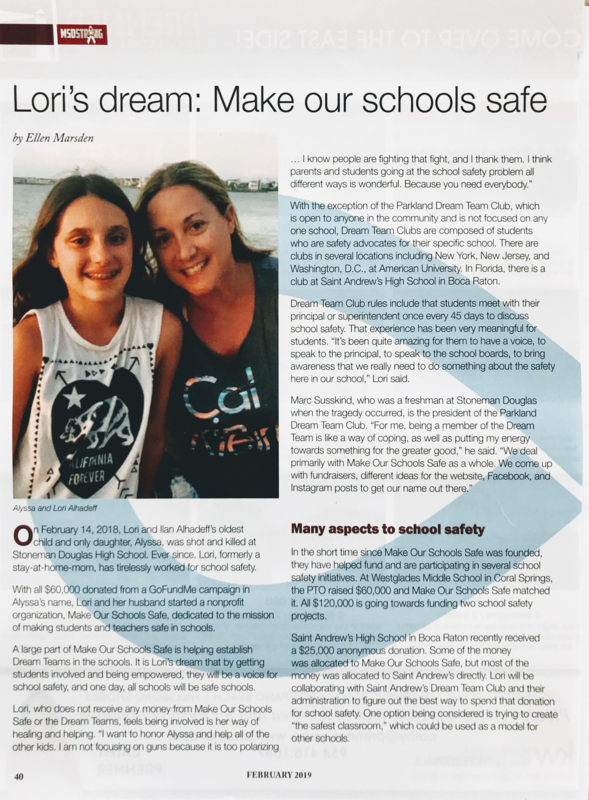 In their mission to provide safety to all students, Lori and the president of Dream Team Club, Marc Susskind, joined forces in their activities in order to achieve stronger impact and be more vocal in increasing the awareness for school safety. The Dream Team Club is primarily composed of students who are safety advocates, however, everyone who wants to make a change in society and create safer schools can join. On the question of the most efficient method for school safety that can be implemented in all schools, Lori says: “There is not just one answer, meaning a, b, and c, you’re done. It’s going to be very specific for each school. Make Our Schools Safe is trying to communicate best practices for school safety and bring awareness through Dream Team Clubs,” adds Lori. In a couple of days, The Alyssa’s Law will be signed as federal law. This law requires public school buildings to be equipped with a panic alarm that would immediately link to local law enforcement. According to Lori, this is just the beginning of the long fight. As she says in the interview, she is resolute in her commitment. “When on February 14, I got a text message, “shot fired at Stoneman Douglas High School, kids running and jumping the fence,” literally from that moment until this moment now, I haven’t stopped. Some people ask, “Don’t you just want to lie in bed?” No, I don’t. I can’t. I feel like I have to accomplish something. The only way I could stop is eventually if I feel my mission is complete. What happened to my daughter on February 14 has empowered me to want to make school safety my mission for life. So, I see this as being ongoing forever,” concludes Lori.